What affects almost everything made of metal, from cars to boats to underground pipes and even the fillings in your teeth? 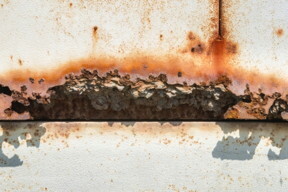 Corrosion -- a slow process of decay. At a global cost of trillions of dollars annually, it carries a steep price tag, not to mention, the potential safety, environmental and health hazards it poses. "Corrosion has been a major problem for a very long time," said UC Santa Barbara chemical engineering professor Jacob Israelachvili. Particularly in confined spaces -- thin gaps between machine parts, the contact area between hardware and metal plate, behind seals and under gaskets, seams where two surfaces meet -- close observation of such electrochemical dissolution had been an enormous challenge, he added. Using a device called the Surface Forces Apparatus (SFA) developed by Israelachvili, he and his research team investigated the process of crevice and pitting corrosion and were able to get a real-time look at the process of corrosion on confined surfaces. Conducted with graduate student Howard Dobbs and project scientist Kai Kristiansen of UCSB, and colleagues at the Max-Planck-Institut für Eisenforschung in Düsseldorf, the study is published in the Proceedings of the National Academy of Sciences. "With the SFA, we can accurately determine the thickness of our metal film of interest and follow the development over time as corrosion proceeds," Kristiansen said. The researchers' setup also allowed them to have control of the salt composition of the solution, and temperature, as well as the electric potential of the nickel surface. Crevice and pitting corrosion isn't the kind of widespread surface rusting you may see on the hulls of old ships exposed to the ocean. These are instead intense, localized attacks, where visible decay can look deceptively minor. In fact, things appear just fine until they fail catastrophically: machines break apart, bridges buckle, seafaring ship engines malfunction, dental fillings fall out. For this experiment the researchers studied a nickel film against a mica surface. They focused on the initiation of corrosion -- the point at which the metal surface begins to dissolve. They observed that the degradation of the material did not occur in a homogenous fashion. Rather, certain areas -- locations where there were likely microscale cracks and other surface defects -- would experience intense local corrosion resulting in the sudden appearance of pits. "It's very anisotropic," Israelachvili said, explaining that even within the crevices, different things are happening near the opening versus deep inside the crevice. "Because you've got diffusion occurring, it affects the rate at which the metal dissolves both in and out of the crevice. It's a very complex process." "The first step in the corrosion process is usually very important, since that tells you that any protective surface layer has broken down and that the underlying material is exposed to the solution," Dobbs said. From there, according to the researchers, the corrosion spreads from the pits and often does so rapidly, because the underlying material is not as resistant to the corrosive fluid. "One of the most important aspects of our finding is the significance of the electric potential difference between the film of interest and the apposing surface in initiating corrosion," Kristiansen added. When the electric potential difference reaches a certain critical value, the more likely corrosion will begin and the quicker it will spread. In this case, the nickel film experienced corrosion while the more chemically inert mica remained whole. "We have seen this interesting effect before with other metal and non-metal materials," Dobbs said. "We have some pieces of the puzzle, but we are still seeking to unravel the full mechanism of this phenomenon." "Basically it's a matter of prolonging the lifetimes of metals and devices," Israelachvili said. Especially these days where devices can be very small, and you can even put them in the body, he added, understanding how to properly protect corrosion-prone surfaces will reduce the need to replace them due to damage. "An important step in the cement formation is the dissolution of cement's main ingredients, silica and alumina, which is very slow and requires highly caustic conditions unsafe for use in large-scale production," Dobbs said. "Improving the dissolution rate while avoiding the need for unsafe, caustic solutions would remove a technological barrier in the implementation of nontraditional cements."